It wasn't the fault of Rachael Ray's paisley scarf. I had given her up before the brouhaha even began. In fact, it had nothing to do with any scandals or raves involving the Food Network's roster (I enjoy Ray and adore Ina Garten, and have a typical foodie crush on Alton Brown, though I confess Sandra Lee makes me want to scream). It was my son Everett, for whom the presence of a television as the focal point of our living room was causing enormous issues. One day, he and I had a huge blowup that ended with me calling Comcast and cutting our television services off entirely. As I waited on hold, I bit my lip and thought, "Iron Chef"? "30-Minute Meals"? "Barefoot Contessa"? What will I do without you? It wasn't meant as a punishment, but for my husband and me, it felt very much like one. Two nights later (I'll allow that the first night was a disaster, as Everett was holding a widescreen grudge), I sat down on my couch with a couple of cookbooks, enjoying the quiet lists of ingredients as the baby nursed to sleep. I was thinking about crème fraîche, so I got out the cookbook that taught me the beauty of the French sour cream. I'd bought the book in college, when I was a sophomore and waiting for my scholarship monies to hit my account; my living expenses could only be collected as cash from the business office several weeks after the term began. In the meantime, I could only spend money on credit at the bookstore, and one day happened upon Sweet Basil, Garlic, Tomatoes, and Chives, by Diana Shaw. I wasn't a vegetarian even in college (vegetarianism goes together with college students like steak au poivre goes with pommes Anna). But due to the aforementioned financial pressures, meat was a luxury, and I read and re-read every word Shaw wrote. Her stories about Provence and Tuscany marked my awakening as a foodie. Under "crème fraîche," Shaw had written, "It's my belief the French have attained culinary distinction largely by adding crème fraîche to dishes that would be unremarkable without it." Now in my living room, some 15 years later, every page was the memory of a meal, a discovery, a passion. Creme Pesto — a sauce of four ingredients, one of which is crème fraîche — was so delicious, even on 79-cents-a-pound supermarket pasta, I made it every night until I'd used up all the Parmesan I could afford. I had cooked a frittata with potatoes and rosemary in my one very good pan. Revisiting Shaw's anecdotes about her time as a young food writer traveling alone in France and Italy, again, connected me to the beauty and simplicity of authentic food. Will I want to make Rachael Ray's sassy take on a croque-monsieur in 15 years? How timeless is her way with EVOO and a can of roasted red peppers? Why does she persist in bringing expensive, but ultimately bland, cuts of meat in their plastic-wrapped shells out of her fridge, modeling such a flawed model of eating? Despite Ray's approachability and my general agreement with the concept that People Should Cook, she really represents much of what is wrong with American home cuisine. It's simplified, but not in the right ways; it's broken down into neat bits, so you can cook meals in 30 minutes without learning anything artful, and without really knowing anything about the ingredients. In Ray's kitchen, the conversation isn't about what your chicken ate or how your tomatoes were grown or whether lettuce is actually in season. It's about how well can you approximate authentic food, how much can you balance, how quickly can you get it on the table, how cute can you be. Shaw's food is not cute. Her food is life-altering, foundation-shaking, but quiet, almost lonely in its real-ness. She writes of how pronouncing "cece" (Italian for "chickpea") could mean life or death in 13th-century Sicily (the French supporters of Charles I couldn't get the hang of the "ch" sound). She writes of mushrooms as a symbol for the fate of a new marriage. She writes, mostly, about taking pride in ingredients, in the things you make with your hands. She does not write about shortcuts. She writes about love, and food, and how those are just two ways of saying the same thing. 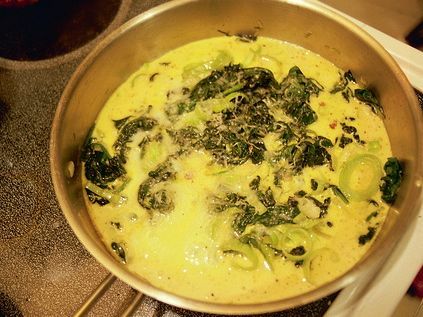 "I love you," and "Here is my baked spinach with eggs and béchamel, my asparagus frittata, my ricotta cheesecake, here, for you" — these are identical phrases. As I am reading about the couple on their honeymoon, the girl who would not eat her mushrooms, I cry, again. I have a baby sleeping on my lap and it is late, too late to find fresh local mushrooms and parsley to pair with the season's first garlic, my own cultured butter for Les Champignons a l'Ail; it is too early in the season to buy four pounds of ripe tomatoes for Sauce Tomate Crue; I do not have basil for that Creme Pesto. But I have cream and I have buttermilk culture, and I lie the baby down in the bed and I pour a cup of cream into a bowl, a tablespoon of culture, I stir and cover it with a scrap of cotton cloth and I know that this meal will take far, far longer than 30 minutes. I must start now, tonight, I must travel back to the 13th century in my dreams, I must dive into this world in which the ages are fused into simple truths, in which sauces are mixed in a mortar and pestle, in which every ingredient has a story that cannot be told in a television set. No, these stories must unfold slowly, over hours and days and generations, we must entwine our own history with someone who is not a brand, who could be nameless and faceless, the woman who said with conviction that her lentil soup was the best in town. My crème fraîche is ready the next day, and I make a simple frittata of potatoes and greens and chèvre, in that same pan I used 15 years ago, stirring in a bit of of the rich sour cream. I eat it slowly, offering a bit on a fork to Monroe. He takes it between his thumb and finger, considers it, then pokes it between his lips. Yum-O.